I LOVED this salad! I was worried that the spinach would wilt super slimy, but it doesn’t at all. I took this recipe from Cook’s Illustrated “The New Best Recipe”. 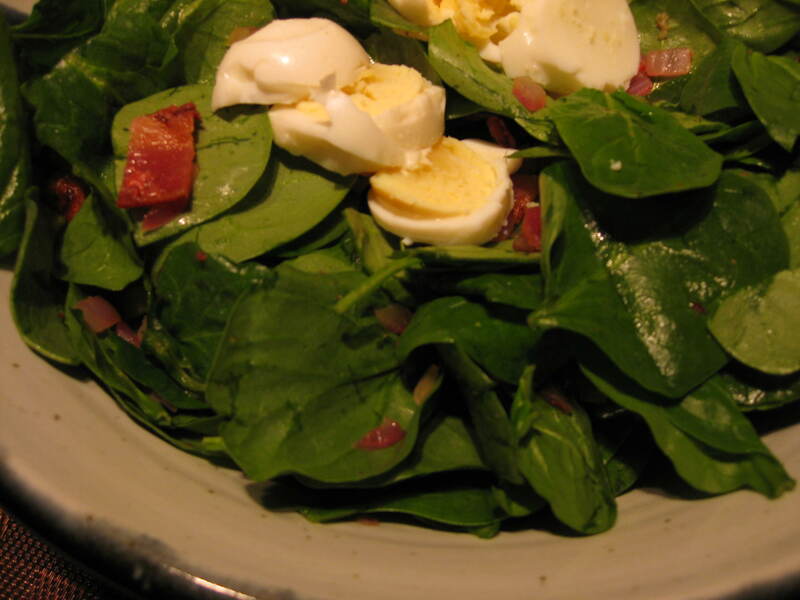 Make sure you use baby spinach since it holds up better to a hot dressing. The cookbook also states that the thick-cut bacon offers more presence and textural interest than thin-cut. 1. Place the spinach in a large bowl. Stir the vinegar, sugar, pepper, and salt together in a small bowl until the sugar dissolves; set aside. 2. Fry the bacon in a medium skillet over medium-high heat, stirring occasionally, until crisp, about 10 minutes. Using a slotted spoon, transfer the bacon to a paper towel-lined plate. Pour the bacon fat into a heatproof bowl, then return 3 tablespoons bacon fat to the skillet. Add the onion to the skillet and cook over medium heat, stirring frequently, until slightly softened, about 3 minutes. Stir in the garlic and cook until fragrant, about 15 seconds. Add the vinegar mixture, then remove the skillet from the heat. Working quickly, scrape the bottom of the skillet with a wooden spoon to loosen the browned bits. Pour the hot dressing over the spinach, add the bacon, and toss gently with tongs until the spinach is slightly wilted. Divide the salad among individual plates, arrange the egg quarters over each, and serve immediately. This recipe is from “Bravo!” by The Best of Bridge. I used chicken thighs but you could just as easily use chicken breasts that are pounded flat. I served this dish with rice and stir fried vegetables. 1. Preheat oven to 375F. Grease an 8-inch (20 cm) square baking dish. 2. Dust chicken with flour. In a skillet, heat oil over medium-high heat. Brown chicken and transfer to baking dish. 3. In a small bowl, whisk together orange juice, honey, hoisin sauce, vinegar, garlic, ginger and cornstarch. 4. Pour over chicken. Bake for 15 minutes. 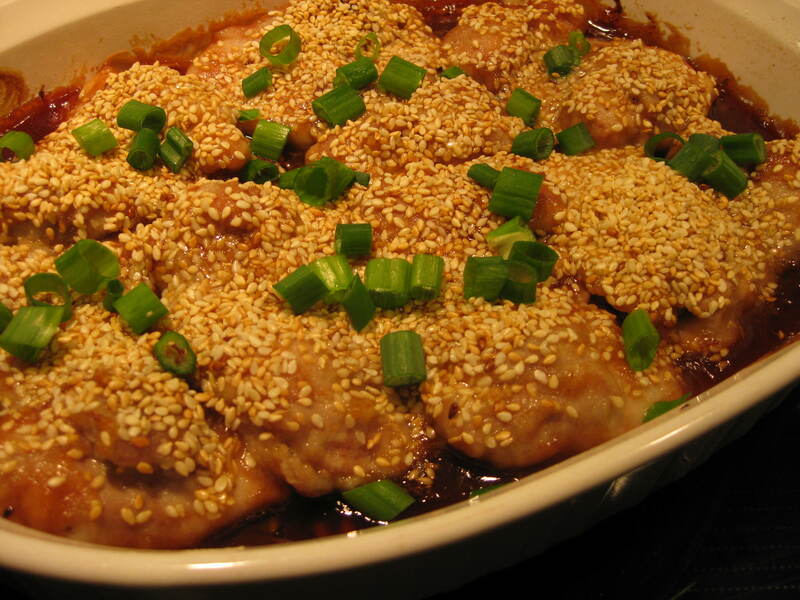 Flip chicken over, sprinkle with sesame seeds and bake for 15 minutes or until juices run clear when chicken is pierced. Serve sprinkled with green onions. Why am I adding a knitting pattern to my food blog you ask? I honestly just need a place to keep it. My kitchen is filled with cookbooks, cooking magazines and cut- out and printed-out recipes from anywhere and everywhere! So, the knitting pattern that I wrote down will be lost very quickly in my mountain of recipes. I used one ball of 100% cotton yarn. The ball I used was a 56.7 g (2 oz) ball. The original pattern said to use a 50 g ball and 6mm needles. I used 5.5mm needles. 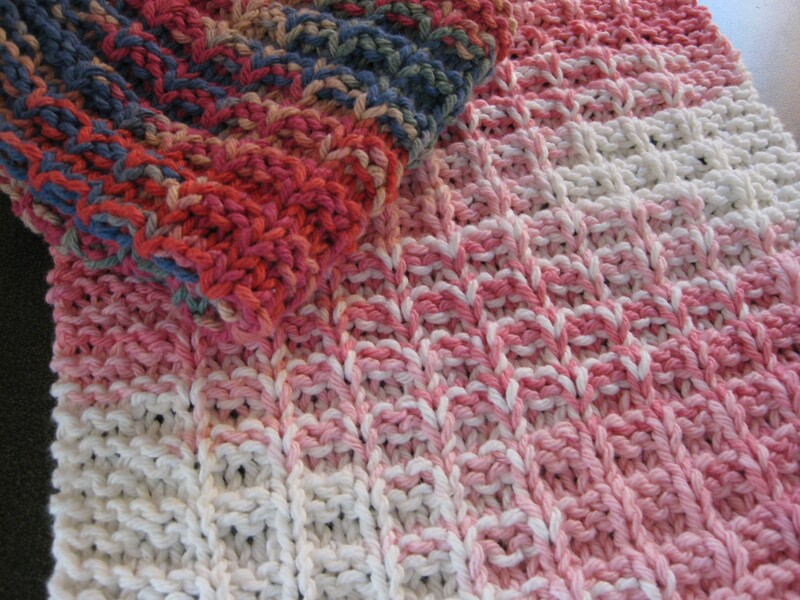 I also knit 13 times the pattern as I thought 14 times made the dishcloth too big. I found this recipe on http://www.cinnamonspiceandeverythingnice.com. I really like this muffin recipe and I love how the outside of the muffin gets crispy like a cookie. I baked my muffins for about 23 minutes instead of the 30 minutes, since the outside were getting nicely browned. I used mini chocolate chips since I had some and they really fill up every bite with chocolate goodness! 1. Preheat oven to 350F. Lightly grease a 12-cup muffin pan. 2. In a large mixing bowl beat the butter, sugar, baking powder, salt, vanilla and cinnamon until fluffy. Beat in eggs, then stir in the milk. Mix in the flour just until combined, then the chocolate chips. 3. Divide the batter evenly among the muffin cups. Sprinkle with a little coarse sugar. 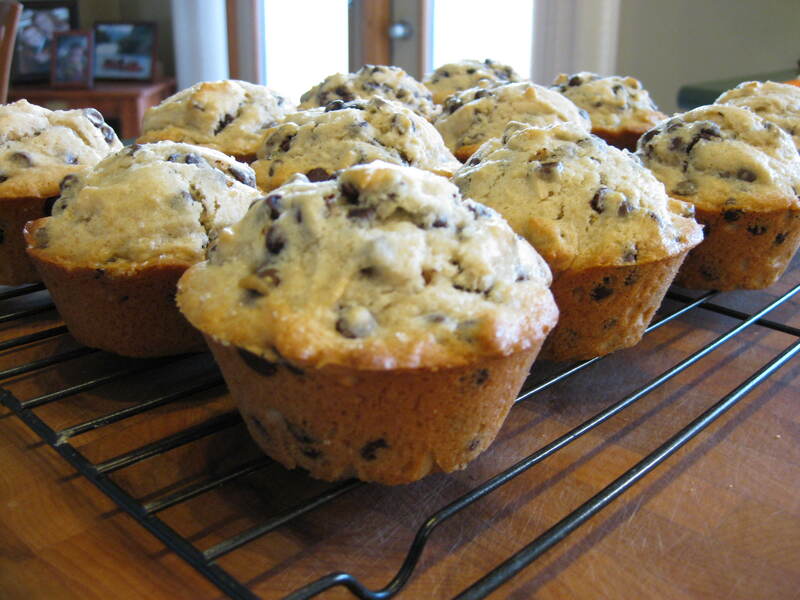 Bake the muffins for 30 minutes, or until cake tester inserted into the center comes out clean. I found this recipe on allrecipes.com. It got rave reviews!! Make sure you give yourself time to make this one, since you have to simmer the sauce for 1 1/2 hours. I used about 17 noodles and I also used grated mozzarella cheese. 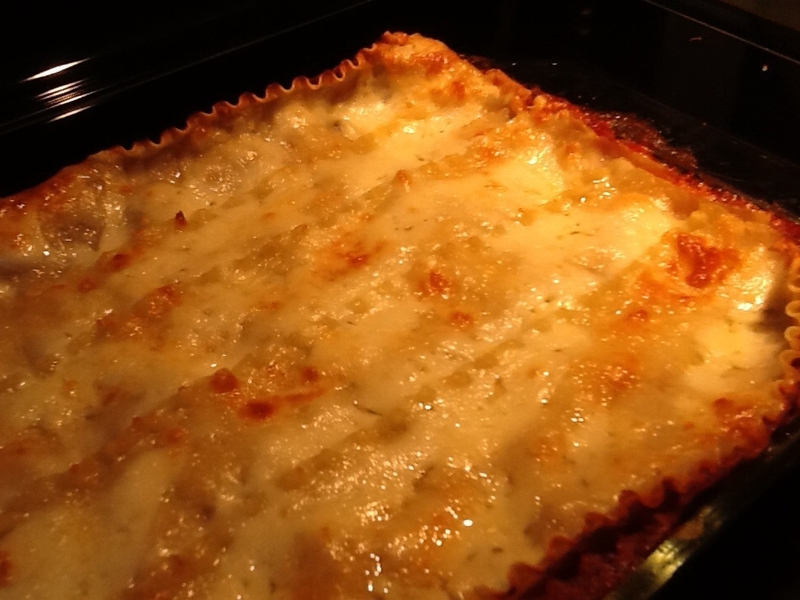 My lasagna started to spill over slightly during cooking, so you may want to put a cookie sheet under your lasagna to avoid a mess. 4. 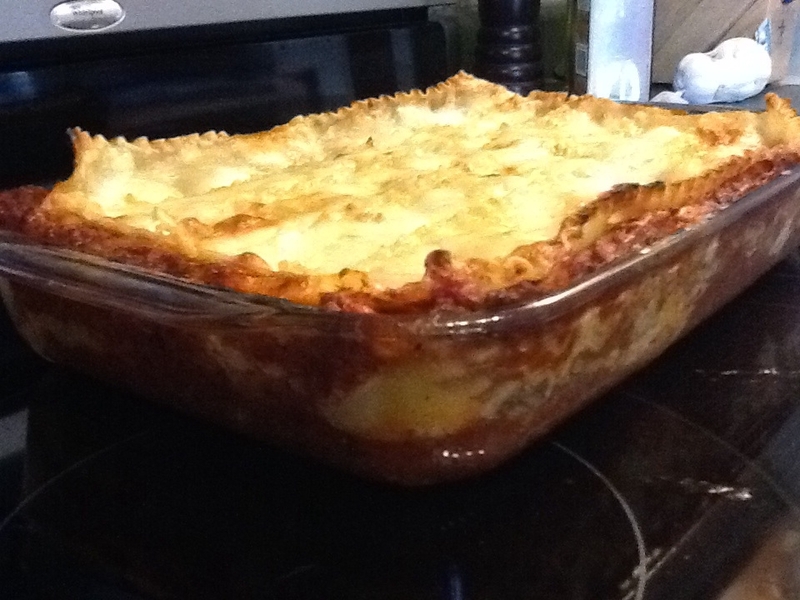 To assemble, spread 1 1/2 cups of meat sauce in the bottom of a 9 x 13 inch baking dish. Arrange 6 noodles, lenghthwise over meat sauce. Spread with one half of the ricotta cheese mixture. Top with a third of mozzarella cheese slices. Spoon 1 1/2 cups meat sauce over mozzarella, and sprinkle with 1/4 cup Parmesan cheese. Repeat layers, and top with remaining mozzarella and Parmesan cheese. Cover with foil: to prevent sticking, either spray foil with cooking spray, or make sure the foil does not touch the cheese.